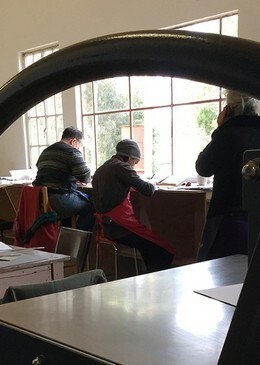 Castlemaine Press Inc. is a community access print studio based at Lot19 in Castlemaine. Initiated in 2014, and opened to the public in 2015, Castlemaine Press is run by artists, has a membership of over 70, and is managed and operated by a voluntary committee of local printmakers. The Press offers its members workspace, equipment and presses for hire, and provides a range of things for the broader community: print exchanges, workshops, collaborative promotion, school and tertiary student opportunities, residencies and projects. Take a look at the Steamroller printmaking project – Full Seam Ahead – for a taste of what’s happened at Castlemaine Press so far!